Wintersweet (Chimonanthus praecox): growing, planting, caring. Chimonanthus - wintersweet - is a genus of flowering plants in the family Calycanthaceae, endemic to China. It is also grown in Iran, probably imported from China. The genus includes three to six species depending on taxonomic interpretation. Wintersweet is a vigorous deciduous shrub growing to 4 m (13 ft) tall with an erect trunk and leaves 5–29 cm (2–11 in) long. Its strongly scented pendent flowers, produced in winter on bare stems, have yellow or pale green-yellow tepals. 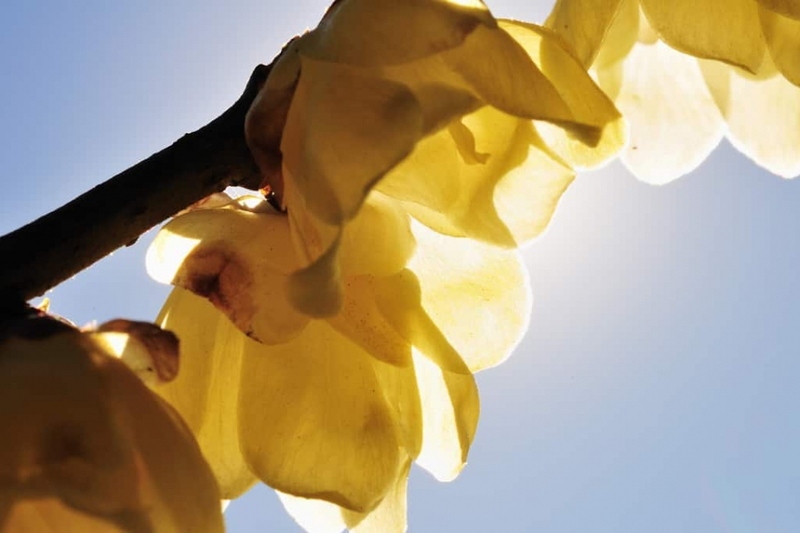 Wintersweet is cultivated in gardens yo produce valued flower colour in the dormant season. Plant from late autumn to early spring, in full sun, in normal, drained and moderately moist soil. Make a hole twice as large as the root ball, without mixing the layers of soil - you will put them back in order at planting. Put back some of the earth from the bottom, and place your mahonia at the right depth. Do not bury the base of the trunks, and fill with the rest of the soil while tamping regularly around the roots. Form a "bowl" of earth around the plant and water until the water no longer flows visibly. Water copiously the first weeks after planting! Then you can space this frequency to once a month. The following years, no more watering, the chimonanthe is adapted to the temperate climate.